And wouldn’t this be a lovely place to do it? 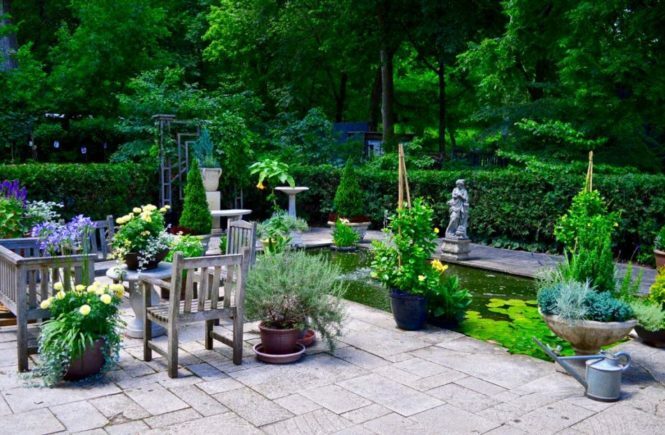 It’s the charming, Englishy-formal pond courtyard at Squire House Gardens in Afton, Minnesota. We visited, all too briefly, on the Minneapolis Fling. 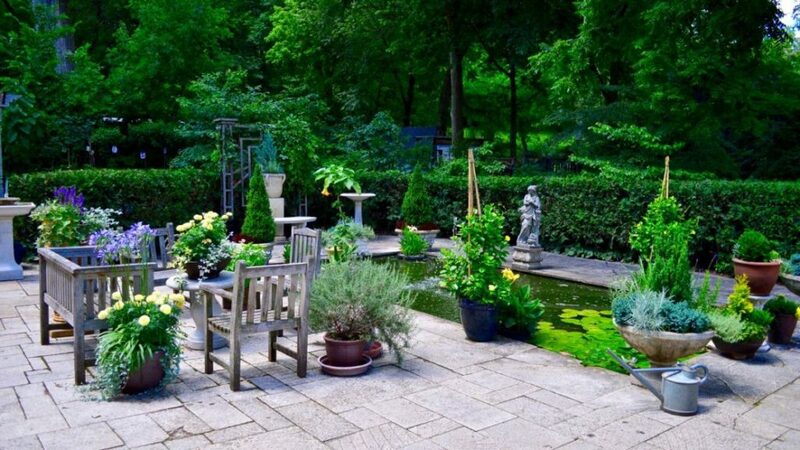 A rectangular pool is really the Little Black Dress of garden design, don’t you think? 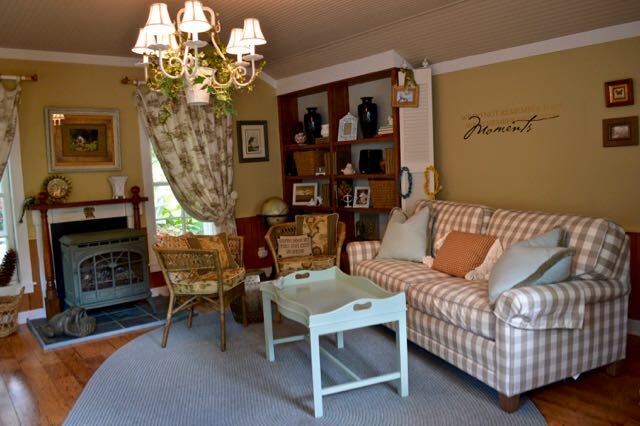 You can dress it up, you can dress it down, you can dress it sideways, all by changing out the furnishings. As you sit here with me, sipping a Pimm’s, can you picture it looking just as spiffy with cool, colourful, mid-century furniture? 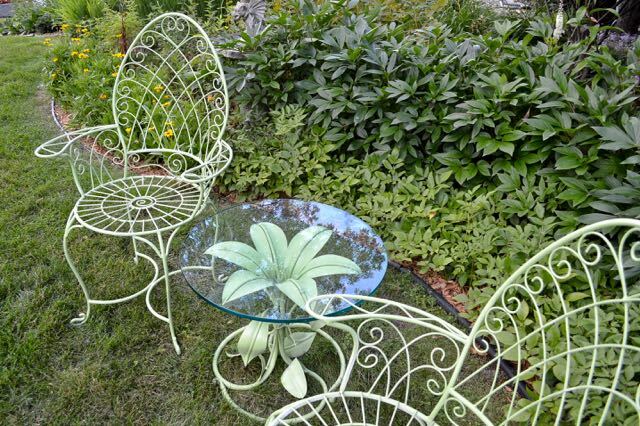 It’s fun to reinvent a garden, isn’t it? Especially when you’re sitting down. Sipping a cool bevvie. And it’s someone else’s garden. Let’s do it some more. 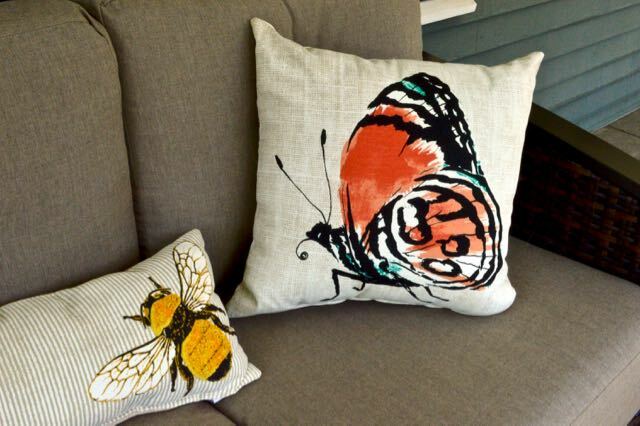 If it gets too sunny, or if we ever get that promised rain (the garden needs it! ), we could take shelter here. 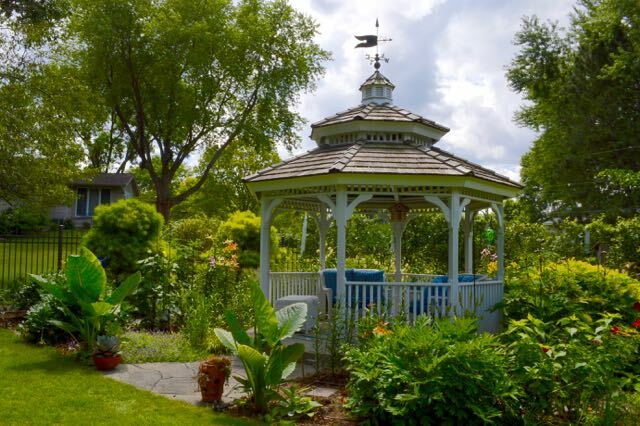 I was lucky to get a blogger-free shot of the gazebo, in the garden its neighbours have nicknamed “Latham Park.” Planting a gazebo in a garden that’s on a bloggers’ garden tour is what you do to create a “Blogger-friendly Garden.” It’s a magnet for that kind of wildlife. When I look at this picture, I think, “Now that’s how you do a gazebo.” Often, they’re left to stand all by themselves in the middle of a lawn. The Lathams placed theirs in the centre of an island bed, including some gorgeous lilies. Isn’t it great? Can you smell the lilies? Mmmmm. Let me top you up, and we’ll wander over to the Lathams’ lily pond. No, you take the bench, I insist. Aren’t the lotus flowers amazing? Once again, the gardeners have given their water feature an embracing backdrop of plants. It feels lush and exotic, not just wet. 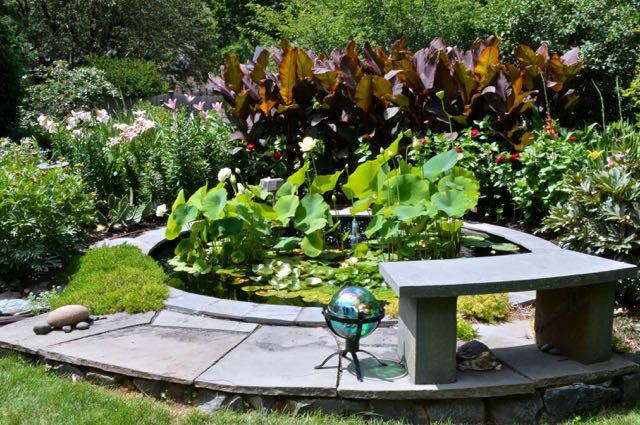 Simple water features are lovely, too. But in this setting I really appreciated the horticultural wrapping. What do you think? How would you describe that chair? With that footrest, it looks to me like a cross between a Muskoka chair (Adirondack chair in “American”) and a steamer chair – like you’d find on a ship’s deck. Whatever you call it, people couldn’t resist sitting in it. Plenty of room for your frosty glass on those arms. 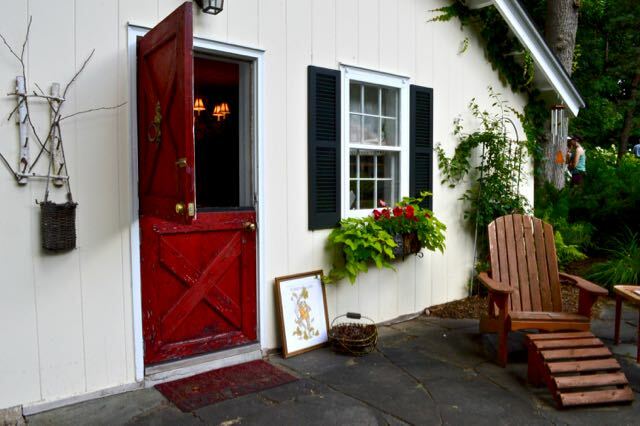 As delightful as the exterior of the cabin was, many of us craned over the Dutch doors to ogle the interior. Mr. TG and I have discussed relocating and redesigning our garden shed. Seeing this, I have the notion to turn it into a nifty She Shed. I know you agree, as always. We won’t worry about silly details like where to put the leaf shredder. May I refresh your drink? Wasn’t it considerate of Laura and Steve to place this bench right here. Come, there’s room for both of us. 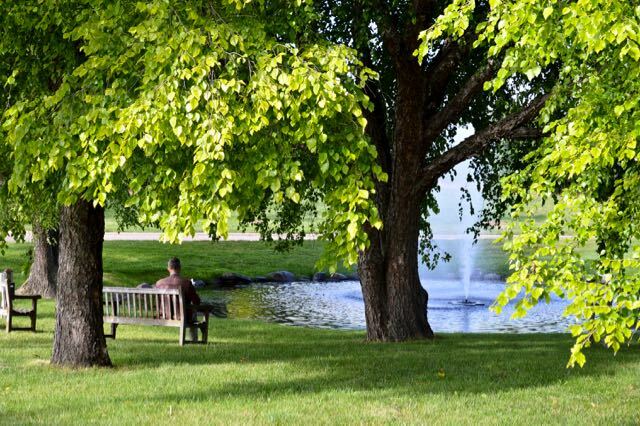 As any well-placed bench should be, it’s perfectly positioned to take in the view. 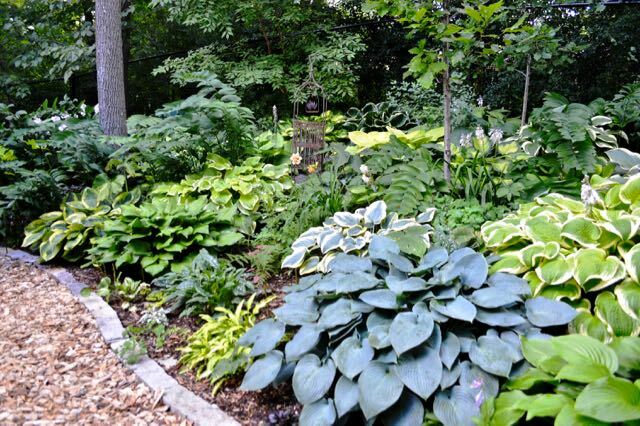 The hostas in Laura and Steve’s shade garden were a tapestry of colours and textures. This was only a small peep. 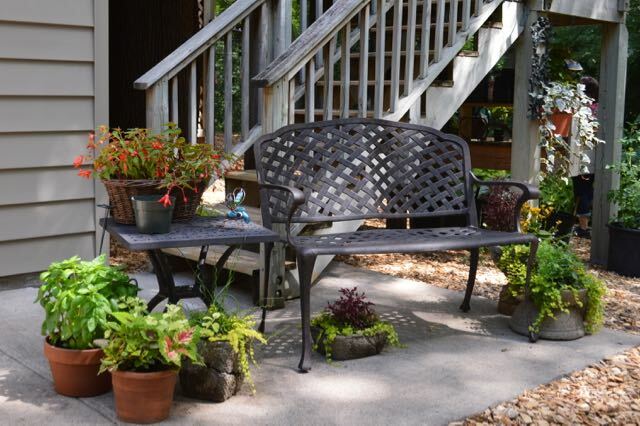 I think of my friend Susan Tomlinson of The Bicycle Garden when I see a bench in a garden like this. Susan is a strong advocate of simply sitting in a garden when you visit one, not running around madly taking pictures of benches (like someone I know). As a matter of fact, I’m surprised Susan didn’t include this in her Five Rules for Visiting a Private Garden. Don’t look them up on your phone yet. Let’s just enjoy sitting here, taking in this view. The wall or curtain of feather reed grass (Calamagrostis) behind the benches at the Minnesota Landscape Arboretum is particularly fetching. Let’s pause here for a while, and watch the bee and butterfly action on the purple coneflower (Echinacea purpurea). 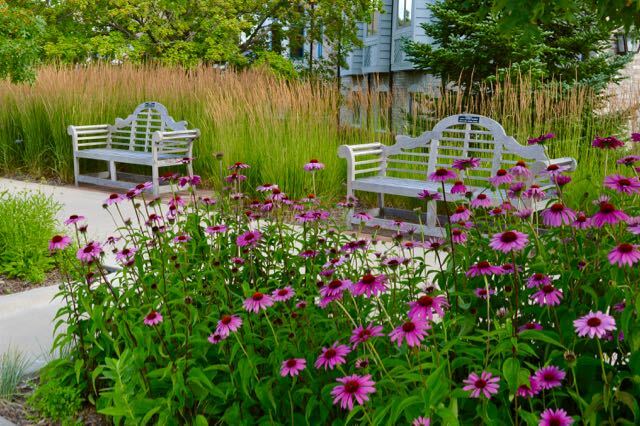 These are Lutyens benches, named after the great British architect and Gertrude Jekyll collaborator Sir Edwin Lutyens. Perhaps while we’re here we can talk about the right way to pronounce “Lutyens” and “Jekyll.” See, I knew you knew. Clearly, a gentleman taking Susan’s advice. How peaceful he looks. I’ve written before how a pair of chairs can be as decorative as artwork. These qualify, I think, don’t you? I’m feeling the word “whimsical” coming on. Perhaps we need another beverage. 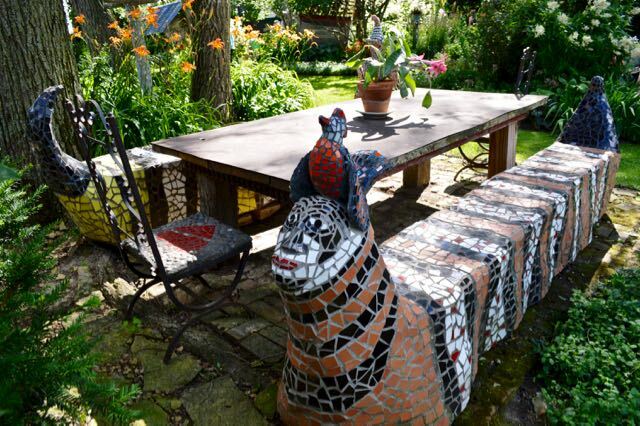 Perhaps we should sit down at this table in Riana de Raad’s garden for another chit-chat with the artist about her work. This fascinating place is easy to return to in the mind’s eye. And, oh, look! I just happen to have dinner for three here in my bag. Can I pass you a plate? 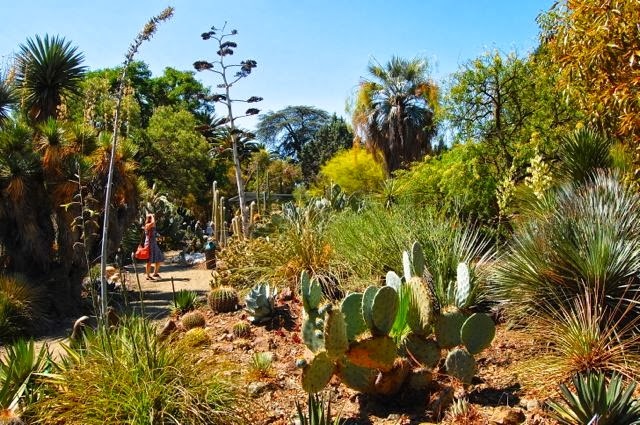 Bring your imaginary cushy chair and your imagination back to Wouterina’s garden. I’ll provide the imaginary beverages. Meet you there, Gail! I’m there, Helen. Every spot looks delightful. Especially on a hot day, Pam.